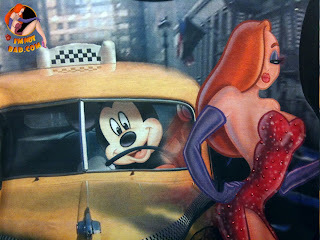 Seldom have we seen any merchandise of Jessica Rabbit and another Disney character - especially when it comes to Mickey Mouse himself! The World of Disney New York offered a shirt that should have been a big deal, but seemed to fall flat for some unknown reason. Lets find out why! Several years ago, when I had seen plush dolls of Mickey and Minnie dressed as Jack and Sally from The Nightmare Before Christmas, I was really surprised. Something like that means the Nightmare characters are being pushed more publicly and/or that the characters are recognizable enough for such a thing to happen anyway. Nightmare started out with a bit of a cult following, and little merchandise available. However, it has now become a huge commodity for Disney. The same is true for Who Framed Roger Rabbit, with the exception of it having only a cult following. The movie was a huge success, but when the characters disappeared (also with little to no merchandising) people seemed to forget about the characters ties to Disney. Cut to the pin collecting craze and Jessica Rabbit arising from the ashes. This made way for other merchandise - mugs, beach towels, statues, and shirts. Disney first tested the waters by pairing Jessica Rabbit with Pluto for a Halloween pin set in 2005. This appeared that the Disney Company had a bit more faith in the Jessica character to bring in money - and to be recognized. If she was not recognizable, this could also show that Disney wanted to start reintroducing her to the public. 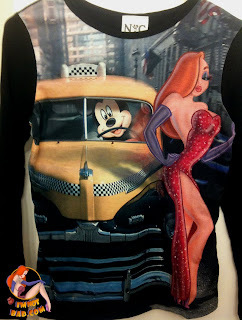 The same can be said for the World of Disney New York shirt featuring Jessica Rabbit with none other that Mickey Mouse! This is a stunning shirt, but it was something made available only to a select market. This was a fitted women's shirt, and I think by not making another shirt that could be worn by anyone, it obviously limited who could buy it. 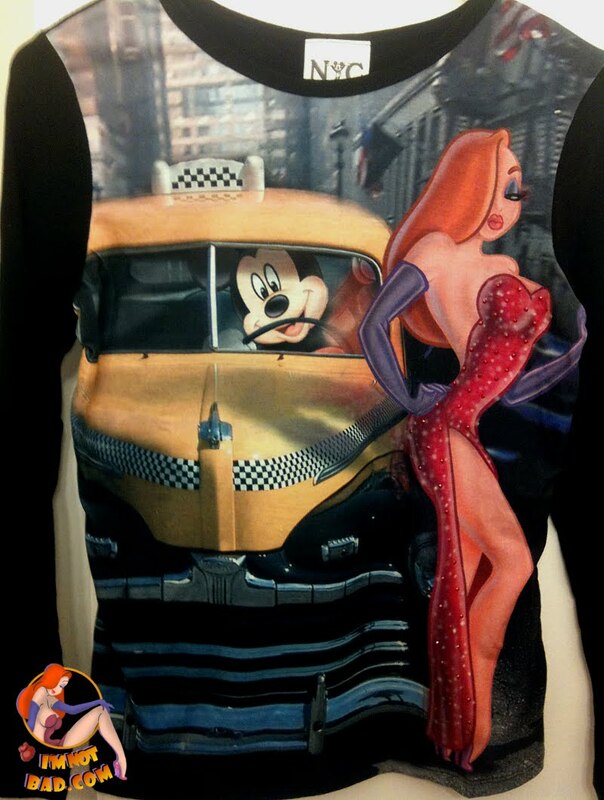 Disney did put a fair amount of work into this garment. 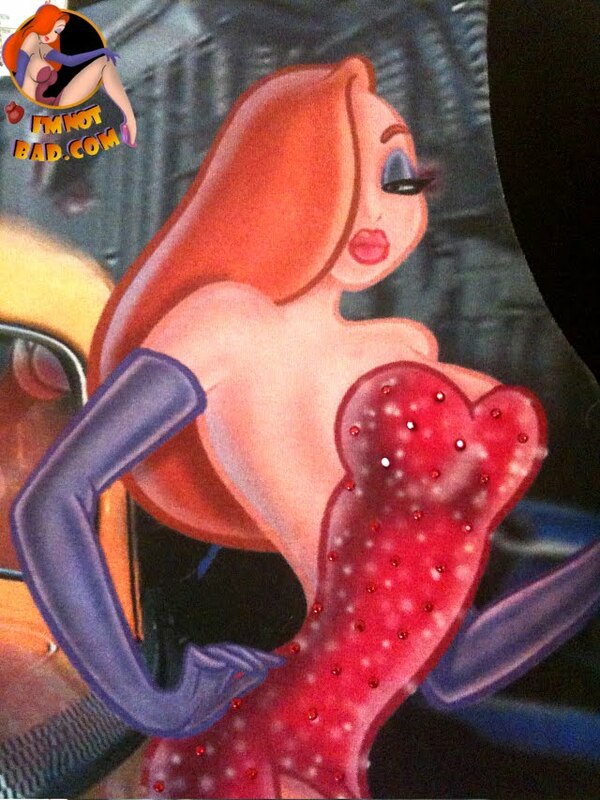 There is a full picture of Jessica Rabbit in all her glory. The image is taken from the Ink and Paint Club scene, so the art is not new, but the recreation of it is superb. She has lots of shadows and highlights - and even sparkles on her dress. If you get a closer look at the photos, you will see Jessica's dress is actually adorned with real beads. They are not pave crystals or stones, but definitely have that look to them. They match the color of Jessica's dress and pick up the light very well. The backdrop, of course, is New York City. Jessica looks to be hailing a cab (on what street thought I cannot tell) and who is the cab drive. Low and behold, it is Mickey Mouse. I was very surprised to see the addition of Mickey along with Jessica. Again it meant Disney was pushing the Jessica character as a mechanisable icon such as Nightmare, the Disney Princesses and several others. Jessica is unlike any of the Disney characters as she can appeal to adults (though by today's standards her look is tame enough for anyone). All elements on this shirt are bright, vibrant and colorful. The gray city backdrop really allows our cartoon friends to - pop out. 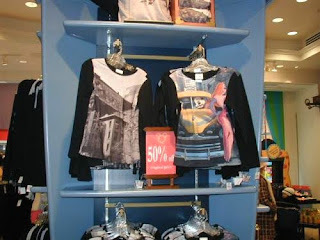 Sadly, from the story this photo might tell, the shirt didn't sell very well for it to end up at 50% off. As I mentioned, it was a tight-fitted women's shirt. This takes out men being able to buy it, and also any women who do not like that type of shirt. I think this would have sold much better as a regular t-shirt. I'm not sure what the other shirt next to it is, but I do have the Jessica and Mickey shirt and the back is all black material. 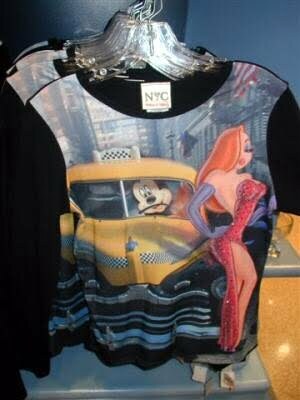 I think this shirt might have been part of a separate World of Disney New York line they were trying out at the time. The Jessica Rabbit and Mickey Mouse World of Disney New York shirt gets a 3½. It's hard to remove points on this solely on the fact I cannot wear the shirt, but I can't overlook this first time use of a Jessica shirt design only for women - who apparently didn't like it as much either. Making it a tight fitted shirt narrows the market even more. Still, it's wonderfully designed and the artwork, although reused, looks great.